Learn about the temperament and personality of the Spinone Italiano. Discover what he's like to live with, his traits and characteristics and how he generally behaves. And look at lots of Spinone Italiano photos. 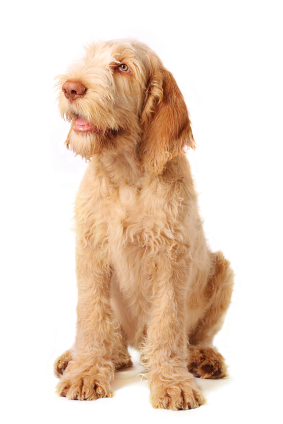 The Spinone Italiano is a versatile hunting dog who is also an excellent family companion. They are easy to train and are willing to do whatever their masters wish. Basic obedience comes naturally to this breed. They excel at obedience and tracking competition and many are successful therapy dogs. They are intelligent and responsive and learn complex tasks quickly. They are athletic, agile, and fast. They are also laid back, gentle, docile, and non-confrontational. While they may let out a deep bark to announce someone is at the door, they are not aggressive with strangers. It is important that the Spinone is socialized early in life so that he does not become shy and withdrawn. This breed thrives on human contact and needs lots of interaction with you. They form an incredibly strong bond with their families. They are great with children, and love playing with other dogs. They get along with big animals, small animals, and livestock. They will however, chase birds. They are nearly always carrying something in their mouths, delivering small presents to you whenever the mood strikes (and you might not like what they bring you!). They can be a bit clownish. They are large and powerful dogs who like to romp around, and care must be taken that they don't accidentally injure a young child. These are adaptable dogs who want to be involved in whatever you are doing. He will probably want to watch you shower to make sure you don't disappear down the drain. But all in all, this active breed is a joy to live with. The Spinone Italiano is moderately easy to train. He learns new commands at the average rate. He is neither difficult nor easy to train. The Spinone Italiano sheds a fair amount of hair. You'll find hair stuck to your couch, carpets, clothes and everything else in your home.